Every business plans new strategies and focuses on improving its services and/or products, simply to generate more leads which ultimately lead to more profit. As a small business owner you are constantly in search of innovative and new ways to drive more traffic to your website and increases chances of conversion. Though this may sound easy but, majority of small business owners in the present day market fail to understand the key requirements of a website that helps to draw traffic. Here are some tried and tested ways through which you can easily increase leads with your small business website. Having a clear idea about the group of audience you want to target is extremely important to use your website as an effective conversion tool. Let’s assume that you are property dealer running a real estate business. Therefore, your website should be designed in a way that would help people to search for their preferred properties in a convenient and easy way. Without a clear idea about the target audience, you won’t be able to design a functional and effective website that immediately engages the audience and increase chances of conversion. You need to think about different factors like age group, location, income, etc. so as to offer your visitors with exactly what they are searching for. People hate to wait while they are searching for some information on the web. Often at times, we come across websites that have poor page load times and we decide to move on to some other site. Thus, testing the page load time is crucial for the overall success of your website. If you are facing similar issues then, immediately get back to the web design company who designed your website and inform them about your concern. If your visitors are abandoning your site because of page load issues, it is quite unlikely that your website will serve the purpose it has been built for. A website should have proper calls to action within the web pages if it wants to turn visitors into prospective clients. The best way to convert your visitors into customers is by providing specific calls to action within the web pages making the conversion process easy and simple. However, it is important to note that excessive use of calls to action within a web page may disappoint the visitors. It is the right combination of information along with call to action that can lead to active participators and repeat visitors. In the present day world where social media is creating a huge buzz, it is a must for your website to include different social media buttons for the purpose of sharing, following as well as visiting your social profiles. If your site has rich informative content then, visitors may decide to like or share it with their friends or family which increases your business exposure. People may find your products and/or services useful and beneficial for them and in turn, visit your website. 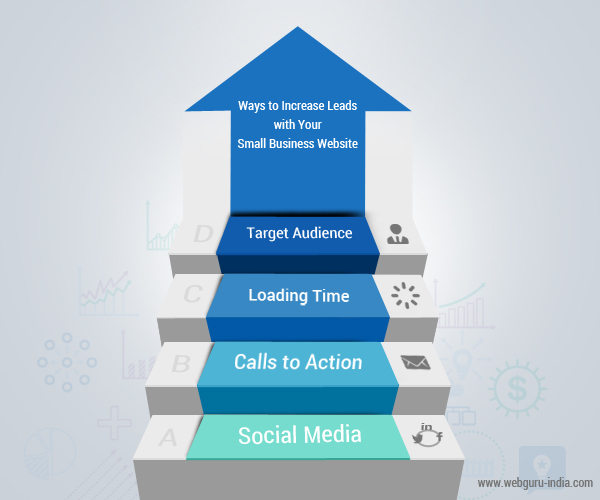 Thus, it is quite clear that increasing your presence socially may prove to be a huge boon for your business increasing chances of lead generation. Increasing leads through your small business website isn’t at all an easy task! However, you can succeed to a great extent if you step into the shoes of the visitor and think from their perspective. Think about what a new visitor to your site would expect and then, come up with a proper plan to lay a strong foundation for your business. Quality and compelling content is another factor that plays a huge role in making your website successful. People love to read fresh, informative content that addresses their interests. Thus, unique and appealing content serves as a useful tool for your brand awareness creating more opportunities for engagement and conversion. Getting many clicks through your website indicates that your ads are performing fine. Thanks for suggesting the tips of increasing leads with a small business website. It is always tough to increase the small business website conversions. However, the aspects mentioned here do work out in achieving a better ROI. I guess live web chat is another feature that can be added to these websites to increase the leads.